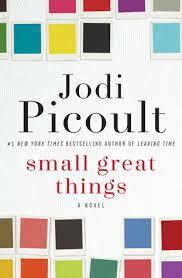 Our final Book Club will be on June 19th and the book chosen by the group is "Small great things" by Jodi Picoult. "[Picoult] offers a thought-provoking examination of racism in America today, both overt and subtle. Her many readers will find much to discuss in the pages of this topical, moving book.” With incredible empathy, intelligence, and candor, Jodi Picoult tackles race, privilege, prejudice, justice, and compassion—and doesn’t offer easy answers. Small Great Things is a remarkable achievement from a writer at the top of her game.